Kids Can Press, 9781554537808, 96pp. It really bothers Daisy when her friend's brother starts to call her Lazy Daisy. But what can she do about it? At first she tries just ignoring him. Then she attempts proving to him that she's not lazy at all. But no matter what she does, he won't stop saying it! So Daisy decides to come up with a new name for herself, one that truly defines her personality. ?I'm going to come up with a name that is so great everyone will forget Lazy Daisy,? she tells her best friend, Emma. Daisy loves words, and she's been having loads of fun using alliteration recently. Maybe that's the thing to try for her new name. But what D word best describes her? Dynamite? Dramatic? Dazzling? This may be harder than she thought! 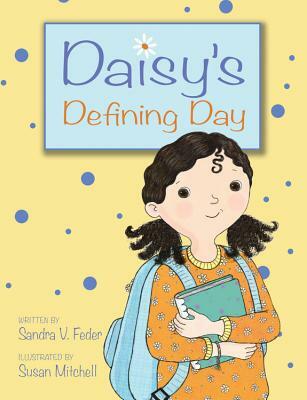 Young readers will enjoy spending time in Daisy's world in this quality early chapter book series by Sandra V. Feder. Daisy is a positive, likable girl, whose delight in words is infectious. Particularly charming is how she keeps lists of her favorites in ?a green notebook covered with purple polka dots,? as well as how she uses her love of words to help solve her problem here. This book is a terrific vocabulary builder without being too difficult for those just beginning to enjoy reading chapter books. It would make a perfect inspiration for children to create their own word notebooks or alliterative nicknames. The sweet line illustrations by Susan Mitchell enhance the storytelling.